As an island nation, coastal erosion through waves, sediment and rocks hitting the shore should be a major concern to everyone. Earlier this year images of the Dawlish sea wall being destroyed and the dangling railway line grabbed the headlines about the power of the ocean; however the severe weather also resulted in many areas of the UK experiencing accelerated rates of coastal erosion. The Environment Agency notes that 28% of the coast of England and Wales erodes by more than 10cm per year in normal circumstances, but the speed of erosion varies from area to area and can sometimes be more. This winter it has been estimated that parts of the coastline have suffered seven years worth of erosion in just a couple of months. False colour image of coastline at Happisburgh, Norfolk. 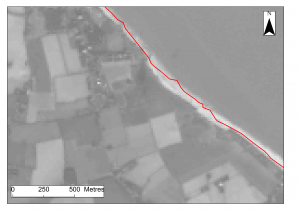 The red line indicates the cliff edge in 2003, the dark grey line indicates the current cliff edge in 2014 and the beach is shown as a white/light grey area. Image courtesy of the U.S. Geological Survey (based on 15 m resolution). Happisburgh in Norfolk is particularly vulnerable to this effect. On 11 December 2013 the BBC reported that following the tidal surge on the east coast, almost two metres of land in the Beach Road area was lost. This left a cliff top bungalow dangerously unstable and sadly, the property had to be demolished shortly after. This area has been studied for many years by scientists, including those from the British Geological Society and between 1992 and 2007 they measured approximately one hundred and twenty five metres of land lost to the sea. On the right Landsat imagery has been used to compare the position of the coastline in 2003 with that of the present day. This can be further supplemented by ground measurements or higher resolution satellite imagery where necessary to provide extra detail. The speed of erosion is affected by a range of factors including the underlying geology, sea levels, weather patterns and coastal defences; even the type of dredging we discussed last week can contribute by changing natural sea defences. Being able to predict what is happening to a coastline is vital to local residents, landowners and town planners; but it’s also critical to bodies, such as the Environment Agency, who decide where to spend money. Protecting the entire coastline isn’t practical, and when coupled with limitations on finances, it’s clear decision makers have an unenviable task of determining which areas should be prioritised for maintenance or construction of sea defences; and which should not. Earth observation data provides a vital resource to support coastal management. With forty years of historical images captured, erosion rates can be measured over time and the effectiveness of sea defences evaluated. We can provide you with imagery and support to develop, and enhance, your coastal monitoring programme from £250. With the ferocity, and frequency, of storms predicted to increase coastal erosion is set to be high up the agenda for many years. Blog produced by Bryony Hanlon, work placement student with Pixalytics, and Andy Lavender. This entry was posted in Earth Observation, Landsat, Space Can Help, visualisation and tagged coastal erosion, coastal management, Earth Observation, Happisburgh, Landsat, pixalytics, satellite image, sea defences by Andy. Bookmark the permalink.